Walk the halls of an IDEA school and you’re greeted by teachers, principals, cafeteria managers, custodians, receptionists, and more of our campus staff who share a common belief—the scholars who learn within our walls are on a path to college. At an IDEA school, we get students ready for college, so that when they graduate from IDEA, they’re truly ready to obtain that four-year degree. 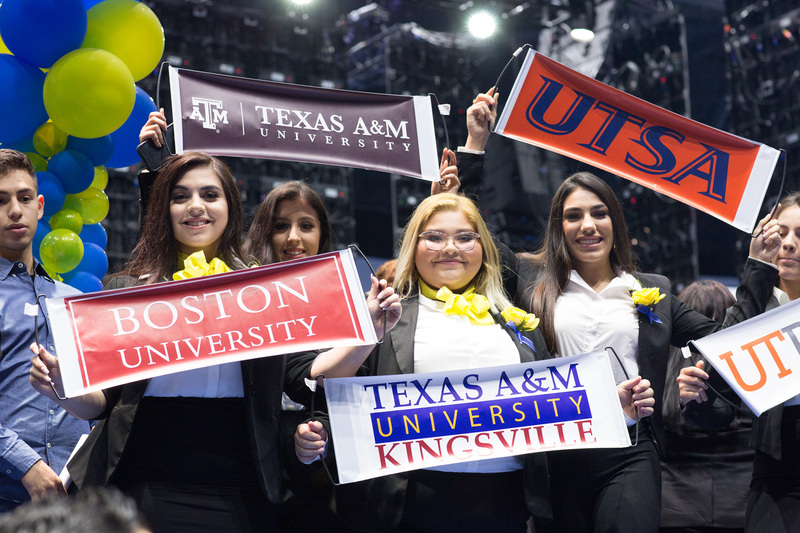 We strive to ensure IDEA alumni graduate from college in four years because that degree will pave the way for success in a career and in life. Our scholars start on the road to college early. It all begins in Pre-K. Walk into a Pre-K classroom and you will see two educators, working with students in small groups, building a foundation for mathematics, language, reading, and science. In fact, more than 98% of IDEA’s Pre-K learners finished the year completing kindergarten math and language work! Keep walking down the hall. On the walls, perhaps you’ll read the “IDEA 55.” The IDEA 55 is a set of essential rules every IDEA student follows, such as: “If you win do not brag; if you lose do not show anger,” or “If you are asked a question in conversation, ask a question in return.” These important lessons are woven into our culture of excellence from a young age. 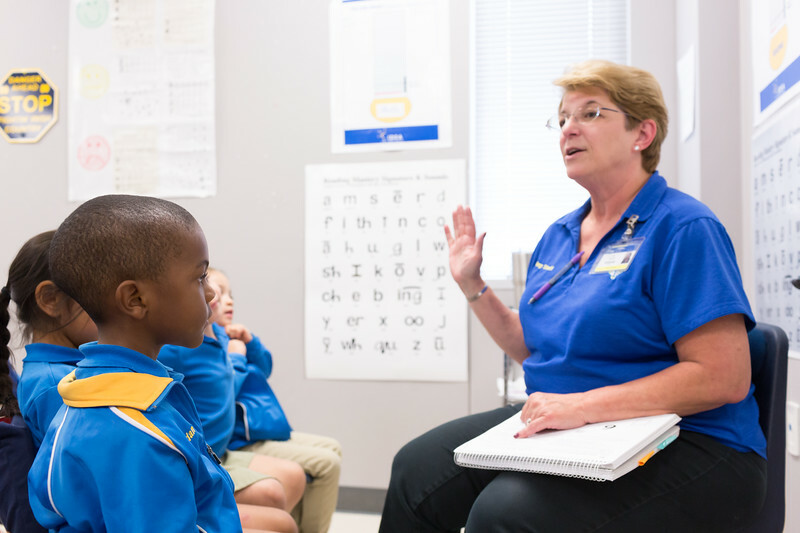 Pop into a second grade classroom, where personalized attention is still the name of the game. Students are reading, practicing math, developing their writing skills, and engaging in science lessons in small groups with two teachers. 79% of our 1st and 2nd graders finished the year on or above grade level in reading, math, and language. The bell rings, and it is time for specials! An IDEA campus is more than just classrooms. We support the development of the whole child including emotional and physical health and wellness. Every day in specials, students either attend (1) P.E. class, where they use heart rate monitors to keep track of their fitness while playing sports, games, and activities, (2) the iLearning Hotspot, where they practice supplemental math via fun, interactive, and personalized computer software, or (3) the Accelerated Reader Zone, a special, quiet space where students read and test on the books they finish, always keeping track of their word count in aim to reach Royal Reader status. These specials are enjoyed by students as young as 1st grade and all the way through 8th. In the upper elementary grades, grades 3-5, students are taking charge of their learning in writing, reading, math and science core classes, where they’re often working in groups, practicing, and actively engaged. IDEA teachers strive to make their scholars the captains of the classroom, because we believe the best learning method is “learning by doing.” The IDEA educator is there to guide, mentor, challenge, and inspire, so that the IDEA student can try, try again, and obtain mastery. And mastery our scholars achieve! Our 3-5 grade scholars outperformed their state-wide peers on standardized exams by 6%. 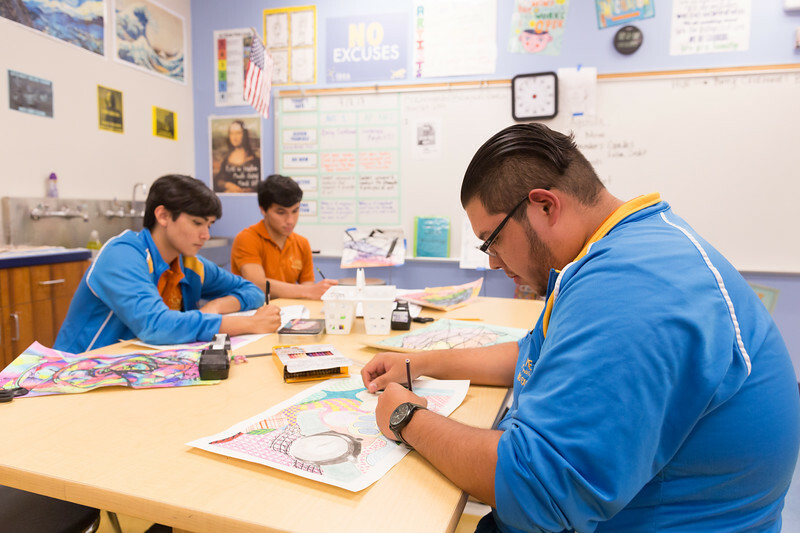 In 6th grade, students make the transition from academy to college preparatory. Take a walk over to the IDEA College Preparatory building. 6th graders begin pre-Advanced Placement coursework, which gears them up for the rigorous AP or IB (International Baccalaureate) classes they’ll take starting in 9th grade. In the college preparatory grade levels, students also begin to take electives to explore their diverse passions and interests, a foreign language, and The Road to and Through College (RTTC) course. RTTC helps define every student’s passion and purpose and aligns them with the college or university that is the best fit. The RTTC class continues from 6th all the way to 12th grade, when IDEA seniors are finalizing their college applications with counselors. In 9th through 12th grade, our scholars are sweating the small stuff and giving 100% every day, taking at least 11 AP classes or 5 IB classes (depending on the campus), participating in a robust assortment of sports and clubs (including UIL athletic and scholastic leagues and an innovative farm and garden program), and growing academically and personally. In fact, 24% of the class of 2017 became AP scholars. That means they passed three or more AP exams. Each year, IDEA grade levels also embark on college field lessons across the country, so they can explore many different universities and see which one is the right fit for them. Stroll a little further down the hall. If it’s springtime, you might even hear the joyous hoorays of a student reacting to a college acceptance letter and celebrating with their Director of College Counseling. There’s no greater feeling than seeing our students, who have worked so hard for so long, achieve their dreams. The best way to get to know IDEA is to experience the journey yourself.